Landscapers in Northwich. 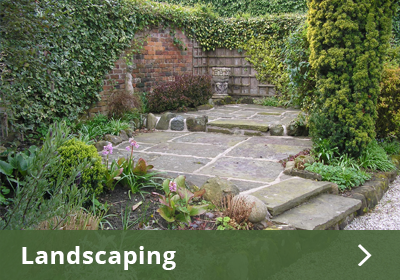 Garden design & maintenance in northwich. All landscaping work is carried out completely by HeavenScent Gardens, this enables us to guarantee that each and every job is to the highest quality possible. We only use the highest quality materials and we source them from local suppliers. This allows us to support small businesses in and around the Northwich area and ensures that we get the best possible product at the lowest possible prices. HeavenScent Gardens offer a wide range of landscaping services, some of which are listed below. This is by no means a definitive list so if you are looking for something that isn’t detailed below then just ask. With more of us owning our own cars it is vital that we adapt our homes to accommodate the growing number of cars being parked on our driveways. We offer a wide range of driveways from natural stone such as York and Indian stone to products such as block paving, gravel, stone sets and concrete slabs. All driveways are installed to the highest quality and have a minimum 6" sub base foundation (depending on the ground) ensuring the driveway will last for years to come. All paving stones are laid on a full mortar bed with traditional wet pointed joints. Whether it be a simple fence to keep the family pet from escaping or a modern screen set among rendered walls and contemporary decking areas, we can offer something to suit every client. We offer a wide range of fencing from post and rail, picket, feather edge, timber paneled, concrete post and base plate and contemporary timber screening. Is it an outdoor seating area, an area to dine and entertain or a place for the children to play that you require? Decking can certainly transform any garden. We offer decking built using quality 6" x 2" timbers with cross members at 40cm intervals. Every deck built is supported by wooden posts which are concreted in to the ground - suspending the deck above ground level. This is to promote good air flow and will prevent any rotting of wood, resulting in a longer lasting deck. Like decking a patio can provide additional outdoor space to relax, dine or play. We offer a wide range of impressive patios using natural stone such as York and Indian stone to products such as block paving, gravel, stone sets and concrete slabs. As like our driveways, all patios are laid on good sub base foundations ensuring the patio area will remain strong for years. All paving stones are laid on full mortar beds with traditional wet pointed joints. A lush green, well maintained lawn is most gardeners dream. We believe that this dream can be a reality. We offer regular maintenance programmes or one off garden tidy ups to treat, cut and scarify (when required) lawns. A tranquil garden setting is not complete for some without the sound of running water. Whether this be a natural pond, a Japanese flowing stream or a free standing contemporary feature, we can install all types. All our car ports and pergolas are hand built to design using high quality materials and craftsmanship. Imagine the adventures your little ones can have in their very own garden den or the storage space you could gain by adding a well built shed to your garden. We offer design and build services for sheds and playhouses or can install pre-fabricated buildings. Contemporary rendered walls around modern decked areas, traditional natural stone walls sweeping around the perimeter of gardens and raised sleeper flower beds all add character and individuality to any garden. We offer bespoke designs which can be incorporated into existing gardens or included in complete garden redesigns. No job or garden is too big or too small so please contact us to discuss how we can help you make the most of your garden.